Below are common attributes associated to Little Cutie Blondie Heuchera. Become a care taker for Little Cutie Blondie Heuchera! 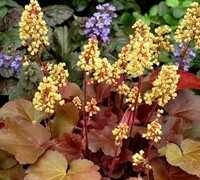 Below are member comments regarding how to plant Little Cutie Blondie Heuchera. No comments have been posted regarding how to plant Little Cutie Blondie Heuchera. Be the first! Do you know how to plant Little Cutie Blondie Heuchera? Below are member comments regarding how to prune Little Cutie Blondie Heuchera. No comments have been posted regarding how to prune Little Cutie Blondie Heuchera. Be the first! Do you know how to prune Little Cutie Blondie Heuchera? Below are member comments regarding how to fertilize Little Cutie Blondie Heuchera. No comments have been posted regarding how to fertilize Little Cutie Blondie Heuchera. Be the first! Do you know how to fertlize and water Little Cutie Blondie Heuchera? Below are member comments regarding how to deal with Little Cutie Blondie Heuchera's pests and problems. No comments have been posted regarding how to deal with Little Cutie Blondie Heuchera's pests and problems. Be the first! Do you know how to deal with pests and problems with Little Cutie Blondie Heuchera? Looking for Little Cutie Blondie Heuchera? Get Little Cutie Blondie Heuchera fresh and large directly from the grower to your garden! Buy Little Cutie Blondie Heuchera online from the nursery wholesalers and save BIG! Heuchera requires no pruning. At the end of winter damaged or discolored leaves can be removed. Heuchera are not heavy feeders. I fertilize them lightly in spring with a slow-release flower food or organic plant food. Conastantly wet or soggy soil can cause problems with the roots of Heuchera.